New body camera footage has surfaced that shows the frantic moments bullets went whizzing through the air during a 24-hour art festival in New Jersey, turning a night of fun into several minutes of agonizing chaos. 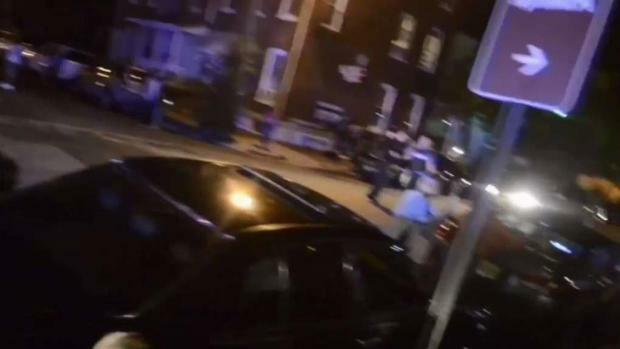 The video of the shooting, which killed one and injured nearly two dozen others last Sunday in Trenton, shows people scattered all over the place and officers racing in to save anyone they could amid the turmoil. A few moments later, officers find another gunshot victim inside. The body camera shows officers start to evacuate the wounded. Cops are seen loading victims into squad cars and then are shown being carried into the emergency room. A New Jersey arts and music festival turned deadly early Sunday morning when a barrage of bullets flew into a large crowd, sending attendees stampeding and leaving 22 people, including a 13-year-old boy, injured and one suspect dead, authorities said. Ida Siegal reports. Just before the video ends, officers are seen using clear, plastic cups to mark evidence. One man, Tahaij Wells, was killed in the shooting. The 21 people hurt were injured either by gunfire or the chaos of people fleeing. Officials have said several fights sparked by disputes between neighborhood gangs broke out prior to the shooting. Witnesses told officials they heard people arguing moments before gunfire erupted. The fight soon spilled out into the street as at least 1,000 attendees ran for cover. Two suspects have been charged. Twenty-three-year-old Amir Armstrong and 26-year-old Davone White are facing weapons charges.